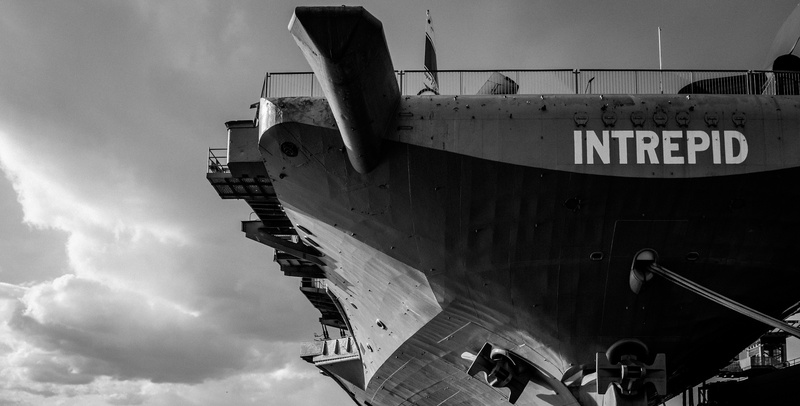 The relief was palpable on all sides aboard USS Intrepid, where more than 600 people, including American and Australian survivors of the Battle of the Coral Sea, gathered to commemorate the 75th anniversary of that crucial battle. President Trump was basking in the glow of a much-needed legislative win on health care. Prime Minister Turnbull's decision to travel to New York a few days before a crucial budget was vindicated, with the two leaders successfully putting their difficult February phone call behind them. A disciplined and presidential Trump stuck to the script, giving a warm and gracious tribute to the veterans. In fact, it was a strong and sometimes passionate speech about the two countries' shared history of military sacrifice and a powerful reaffirmation of the alliance. No doubt there will still be questions about President Trump in Australia: will he define an American role on trade, development and other issues that have long been at the heart of US-Australia cooperation? Will he staff the State Department? Will he adopt a more inclusive political narrative at home in the US? When Trump and Turnbull first encountered each other on the telephone, the National Security team in the White House was an incompetent wreck. This time, the President’s meeting was staffed by the most cohesive team of national security principals since the George HW Bush Administration. National Security Advisor McMaster, Secretary of State Tillerson, and Secretary of Defense Mattis are profoundly strategic and international men with mutually reinforcing world views and mutual respect. But this is only the end of the beginning. The Battle of the Coral Sea blunted Japanese expansion towards Australia, but the allies faced another three years of hard slogging before victory. Looking beyond the successful turn-around in the Trump-Turnbull relationship on the Intrepid, there are tough issues facing the US and Australia that will require real trust, real coordination and real strategy. Washington and Canberra are still divided on trade policy. Perhaps the combination of TPP-11 talks, NAFTA (the North American Free Trade Agreement) negotiations, and the US-Japan economic dialogue will shoehorn the Trump Administration back towards the trans-Pacific architecture that 49 of 50 US governors and a majority of Republicans in Congress hoped for with TPP. Kim Jong-un has also helpfully reminded us that he intends to be a threat to Australia too, and not just Japan, Korea and the US. And China’s calm before the 19th Party Congress does not mean that the US and Australia have escaped the requirement for a joint strategic approach to the challenges in the South China Sea. Perhaps most important of all is the need to renew the Australian public's understanding of the essentiality of our alliance to the open and stable order we all enjoy in the Pacific. The authors have each held senior positions in our respective governments and have generally downplayed concerns about public support for the US-Australia alliance over the past 10 years. Candidly, we are now growing concerned. No other US ally in the Pacific has had, in recent history, two former prime ministers actively attacking their country’s alliance with the US. While the 2016 Lowy poll demonstrated broad support for the alliance in Australia, it was not deep – particularly among millennials. We will need more than the warm and cordial summit on board USS Intrepid to address this creeping problem in the alliance. We will need our leaders to go beyond reconfirming our indispensable alliance and to begin charting a compelling path forward together. Photo by Flickr user Jorg Schubert.